Established in 1983 we are your local stockist of plumbing, heating, showers and bathrooms. 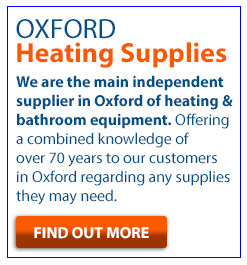 Headington Heating & Plumbing Supplies is your local specialist plumbing and heating supplier. Established in 1983 and with more than 60 years' experience between the current team, we are well equipped to offer you expert advice and assistance with your plumbing or heating project. We pride ourselves on a professional, friendly and helpful attitude, and we feel this is reflected in the large number of repeat customers we are proud to help. We also enjoy a lot of new business through recommendation and referral. We are also your local stockists of water softener salt tablets 25kg bags as low as £7.72 inc VAT and water softener block salt as low as £3.92 inc VAT. To find out why our customers keep coming back to us, call Headington Heating & Plumbing Supplies. We are located on Lime Walk in Headington, Oxford.